The Sidekicker app holds all the secrets to your Sidekicker universe. Knowing how to use it is vital for your successful career as a Sidekick! The "Categories" heading will allow you to filter your dashboard based on specific roles. To see all jobs you have access to, ensure you have selected "All". You can easier navigate through each section of your app to see what jobs are available, what jobs you've been selected for and at what stage your application is at. Let's take a closer look at all the sections of your app. When a job is first posted, it will appear in the "Open" section of your dashboard. All jobs located in this section are jobs you can apply for. Please note if a job doesn't appear in this section of your dashboard, this means your account hasn't been activated to work in the required category set out by the client. In this instance, you won't be able to apply for the job. After you submit your application statement to a job, it will move from the "Open" section to the "Applied" section. Your application will sit in this section until it has been reviewed by the client. 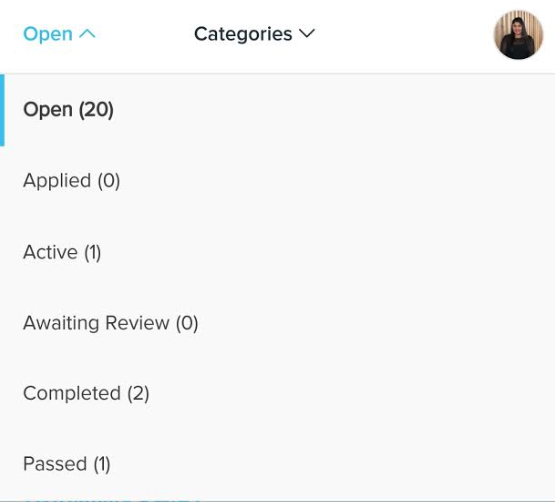 If the client accepts your application, the job will then move to the "Active" section of your dashboard and you will receive a notification. If the client chooses not to select you as their Sidekick, the job will disappear from the "Applied" section and you should be notified by email. If the client accepts your application, the job will then move to the "Active" section and you will receive a notification. 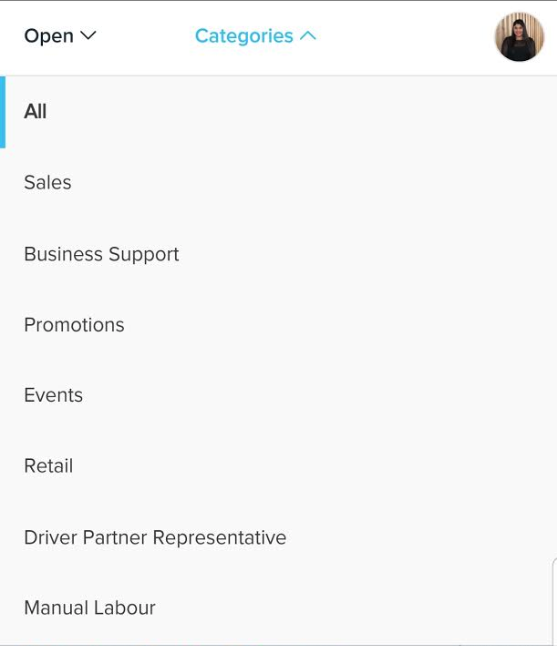 Once a job is in this section of your app, the job is yours and you will be expected to attend. You can always head to this section of the app to see all the details of your shift and log your hours once you have worked the shift. If for any reason you need to withdraw from a job within your "Active" section, it's important you do so as soon as possible by clicking the withdraw button on your app. For any help with withdrawing, just refer to this article. After you complete your timesheet the job will move into "Awaiting Review". This is where the client reviews and approves your hours for payment and they can leave a review and star rating. Sometimes it can take longer than usual for a client to review your hours, but please know you will be paid for any job in this section come pay day -- the job does not need to be completed for you to be paid. Once the job has passed through the previous sections, it will move into the "Completed" section. This allows Sidekicks to view the shifts that they have previously completed on their profile. When you click on a job in your open projects, it will give you an option to pass or apply. If you click pass, the job will be sent to your "Passed" section. This removes the job from your "Open" section, allowing you to filter the jobs that you prefer.